Enhanced Abilities: Captain Nazi has superhuman strength, agility and endurance. Body Armour: Captain Nazi has some protection from physical and energy attacks. Flight: Captain Nazi is able to fly. Albrecht Krieger and his elder brother Wolf were born the sons of a pimp and a prostitute, both suffered physical abuse at their father's hand and young Albrecht witnessed his father beat his mother to death over groceries. 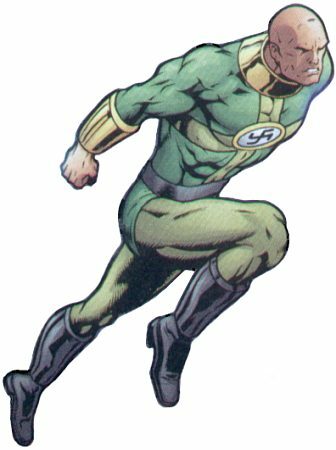 He was at a later time recruited for the Nazi super soldier program, he was one of the only surviving applicants and quickly became known as Captain Nazi.